The biggest of six, the One World Trade Center is a solid testament to New York’s unwavering ability to renew and recover. A phoenix arisen out of the ashes, the reflective monument stands at 1776 feet tall (inclusive of the 408 foot antenna) and is powerful salute to the year the United State Declaration of Independence was signed. It also holds significance for being America’s tallest building. The design process of the World Trade Center precinct took place almost immediately after the original two trade centers were decimated. There was no way the American people would submit to fear, despite the mass scale of destruction. This time however, the world trade precinct would be better. It would be better designed, stronger, more durable and safe. In November 2014, the One World Trade Center was completed. The One World Trade Center is a sky-scraper that reasserts downtown Manhattan’s place as a global business center. Primarily offering 69 levels of office space, the building also features an observation deck, world-class restaurants and a light-filled grand lobby which encircles the central core. Below-grade shopping can also be found. , which took control of the project in 2006, Eduardo del Valle explained to Architectural Digest “it has a concrete core, with very thick concrete walls.” Containing three-foot concrete slabs, the structure is able to withstand high winds and earthquakes, also high grade fire suppression systems and dedicated emergency stairways for personnel. There is also a ‘podium’ made of rock that acts as an anchor of sorts. “The podium has some hefty blast-resistant walls at the base,” he says. “I can tell you that it may not be the tallest building in the world, but it is certainly the safest,” says del Valle. The One World Trade Center has been built with visitor and office tenant traffic in mind. Entrances on all four sides of the building allow for access to all facilities. Partnering with the free and uncongested flow of people, the capacity for mass exodus was warranted as a design feature necessary to perilous times. Exits are designed to ensure easy evacuation, and all safety systems are encased in the core wall. The building boasts extra-wide pressurized stairs, multiple backups on emergency lighting, and concrete protection for all sprinklers, all of which ensure optimal fire fighter access. The elevators, designed and installed by ThyssenKrupp Elevator Corporation, are the quickest in America. The five express elevators riding directly to the observation deck and restaurant travel over ten meters per second – close to record-breaking speed. This means a trip to the top takes less than three-quarters of a minute. “We had to come up with intelligent solutions to manage these passenger numbers, because a building like this just wouldn't be possible if we couldn't transport people and materials smoothly. The higher the building, the higher the ­demands on us engineers,” he said. Only ten elevators will travel directly from the ground floor to the roof. The five service elevators can stop at every floor. People working higher than the 64th story will first take an express shuttle to the sky lobby and from there take one of the elevators serving the highest office levels. 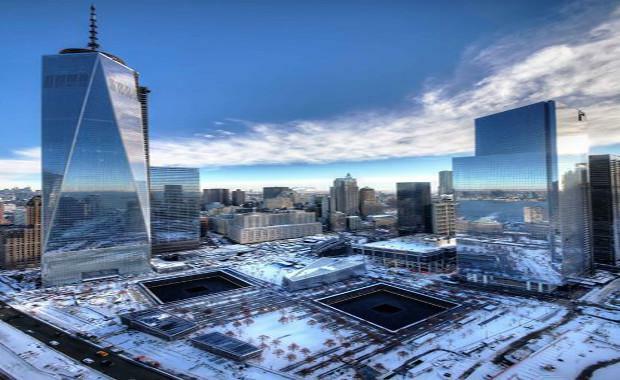 One World Trade Center, a glittering sky-reflective monument, purposely shares an area dedicated to the solemn remembrance of the 2500 people departed. Darkly coloured waterfalls signify the footprints of space once taken up by the former two World Trade Centers. On the memorial, One World Trade Center architect, David Childs of Skidmore of Owings & Merrill said, "we continue to be dedicated to the goal that the strength of the building's simple geometry as the vertical marker for that most important element—the Memorial—and the memory it evokes of the form of the missing towers will triumph, honouring those who lost their lives, filling the void torn in the downtown skyline, and verifying the steadfastness and endurance of our great nation." The names of the departed killed in the September 11th attacks and in the 1993 World Trade Center bombing have been inscribed around the edges of the memorial pools. The One World Trade Center is new in every respect, and symbol of American ingenuity and business-like efficiency. It is a true reflection of the people of the New York.